Congratulations To Our 2016 Christmas Amendment 3 TV Competition Winners! 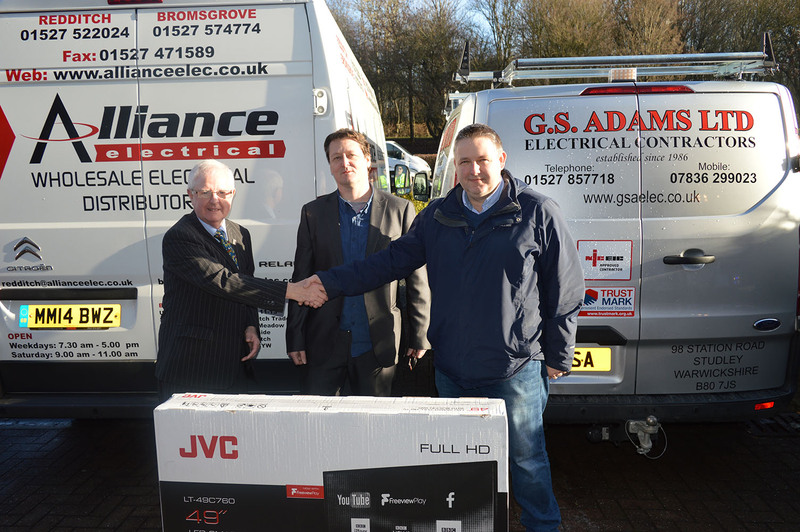 The winner of Protek’s ‘Win a TV for Christmas’ was GS Adams an electrical contractor local to the Redditch branch of Alliance Electrical, Redditch. The competition was open to all NICEIC or ECA approved electrical contractors through the UK. All they had to do was purchase a product from the Amendment 3 range on offer in any one of Protek Electronics Premier Stockists. The branch had to sign the entry form to validate the entry and it was then posted in the collection box on the trade counter. Neil Smith the MD of GS Adams was delighted at winning the TV and is going to present it to the local branch of the YMCA in Redditch. For more information on GS Adams visit their website www.gsaelec.co.uk. Alliance Electrical also has a branch at Bromsgrove.